Monroe Hinge & Stamping Company has the capability to manufacture Continuous Hinges in a wide variety of lengths, metals and finishes. Continuous hinges are used in many products, fixtures, industrial settings and many other applications. 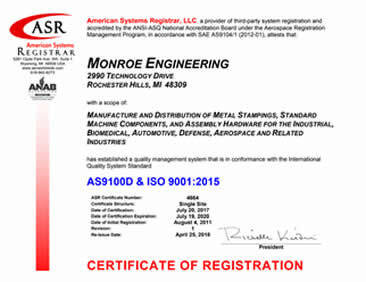 Monroe Hinge & Stamping Company is ready to work with you on developing the right Continuous Hinge for your application. All of our projects start with a question, a print or a sketch. Computer numerically controlled (CNC) punching is a sheet metal manufacturing process that is carried out by CNC punch presses. These machines can be either a single head and tool rail (Trumpf) design or multi-tool turret design. Laser cutting is a technology that uses a laser to cut materials. The laser optics and CNC (computer numerical control) are used to direct the material or the laser beam generated. Laser stamping is a technology that uses a laser to stamp materials. The laser optics and CNC (computer numerical control) are used to direct the material or the laser beam generated. A press brake is a machine tool for bending sheet and plate material, most commonly sheet metal. It forms predetermined bends by clamping the workpiece between a matching punch and die. Are you looking for Hinge Forming?